ActiveWorlds has launched the 4.2 version of their client software, server software and SDK. An extended explanation on what these features mean is in this article on AWPortals. AWPortals is a community site that covers news from ActiveWorlds. It also has resources, models and textures search engine. Those who have tested the new client says it runs a bit smoother and looks better. Also, having customizable avatars (through morphing) improves ActiveWorlds to a similar level as other virtual worlds. The requirements for ActiveWorlds clients are very low, as seen here, which is a big advantage. ActiveWorlds client. Photo by Daniel Voyager. 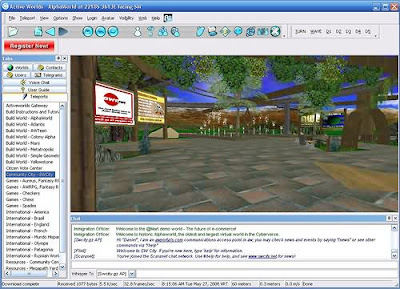 ActiveWorlds has been online since 1997, being one of the most veteran 3D chat and virtual worlds community out of the whole world. Their business model is to be supported by its members paid subscriptions, and grow slowly, so you may have not heard too much about them. But this great community deserves our attention. These days, new virtual worlds platforms try to generate the maximum hype that is possible. That way, the generate big income but also big expenses. ActiveWorlds got to be sustainable in the long term. Many people are re-discovering ActiveWorlds nowadays, although they've been there since the beginning. The renaissance of the interest about virtual worlds is re-activating the interest about AW. I will not abstain from this new wave of interest. In the future, I'll pay more attention to ActiveWorlds, as it is proved as one of the main branches of virtual worlds. Here's a video of ActiveWorlds, that will give you an idea on how it looks. Definately agree. Active Worlds has been around a long time and keeps getting better. The new look is great and I am checking it out. Yes Omind, the 4.2 update was long awaited for the customizable avatars feature.